JMS’ support of the non-profit Ocean Technology Foundation’s quest for the Revolutionary War ship BONHOMME RICHARD (BHR) continued this year with its most complex and collaborative mission yet with generous corporate sponsorship from Resolve Marine Group. The French Navy provided substantial support to the North Sea search. A hydrographic ship equipped with side scan sonar and a magnetometer scanned the seabed for the first week of the mission. During the next two weeks, a sonar-towing ship worked in tandem with a dive support ship and divers to more closely investigate targets found during the first week. A U.S. Navy team operated an Autonomous Underwater Vehicle from the dive ship, providing opportunities for training French Navy divers in its application, and using it to further classify targets. This was the fourth collaborative BHR mission between the US and French Navies in as many years. This international quest is a symbol of the two nations’ intertwined maritime histories, with the French having loaned the BHR to the young Continental Navy. The team added another 37 square nautical miles of seabed to the area covered in previous missions. Project Manager Melissa Ryan blogged the expedition in order to share events at sea as they were happening (http://searchforbhr.blogspot.com). After dives on many irregularly shaped rocks and sand formations, and during the last hour of the mission, one interesting target was discovered and is worthy of further investigation on a future mission. It was too deep for divers to reach, so a Remotely Operated Vehicle will hopefully conduct the next phase of the investigation. On September 23, 1779 one of the fiercest battles of the Revolutionary War took place off the coast of Flamborough Head, England between BONHOMME RICHARD and HMS SERAPIS. BONHOMME RICHARD was captained by John Paul Jones who is often considered the father of the United States Navy. The battle between the two ships took place at point-blank range and lasted almost three and a half hours. 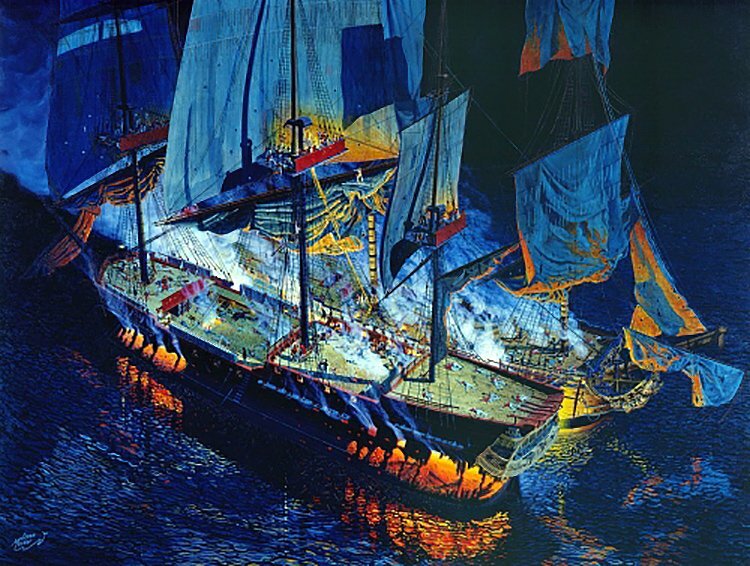 John Paul Jones emerged from the battle victorious and captured SERAPIS as his prize. It is a common misconception that the BONHOMME RICHARD sank at the site of the battle with HMS SERAPIS. In fact, the ship drifted for 36 hours afterward, with Jones’ crew trying to save her — which makes the search particularly challenging. Over the past seven years, OTF and JMS have conducted extensive archival research, created a Geographic Information System map containing charts, wreck lists, and geological data, and designed the first computer hydrodynamic drift model created to find this ancient shipwreck. The end product was a comprehensive GIS map and database of potentially significant cultural resources and surface geologic features in the project area where the BONHOMME RICHARD is believed to have sunk. OTF and JMS have conducted expeditions every year since 2006 to investigate potential sites. Major assets have included the US Navy’s NR-1, USNS GRASP, French Navy mine hunters and research vessels, private research vessels, and numerous ROV’s and AUV’s. The search for the BHR is a quest that belongs to everyone — the interested citizen, the history buff, the donors who support the Ocean Technology Foundation, the men and women who serve or have served in the Navies, and young students whose interest in marine technology is piqued by learning about the BHR missions. The expeditions have been an outstanding demonstration of the power of Naval partnerships, interoperability, technology transfer, and maximization of resources toward a common goal.